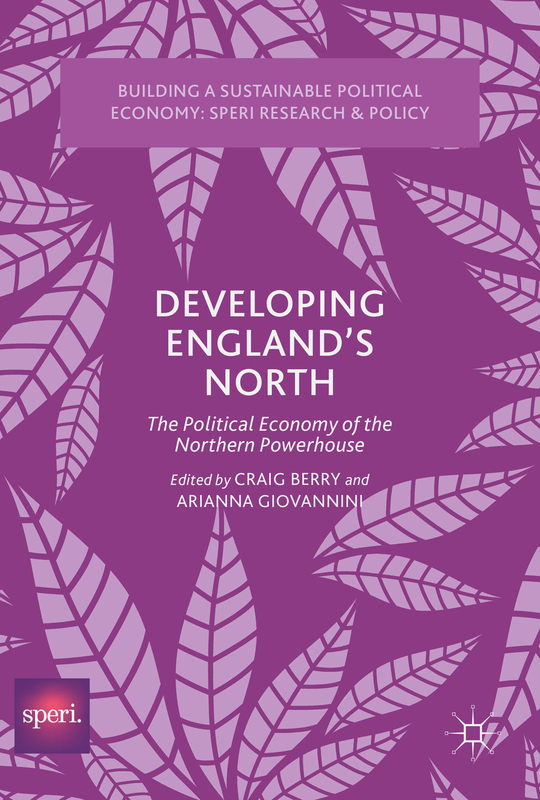 SPERI is delighted to report that Developing England’s North: The Political Economy of the Northern Powerhouse, edited by our deputy director Craig Berry and honorary research fellow (and senior lecturer at De Montfort University) Arianna Giovannini, has been published by Palgrave. This collection explores the politics of local economic development in Northern England. It starts from the premise that socio-economic conditions in the North – and its future prospects – have become central to national debates in the UK. The status of Northern regions and their local economies is intimately associated with efforts to ‘rebalance’ the economy away from the South East, London and the finance sector in the wake of the 2008 financial crisis. The contributors to this volume (which arises from a 2015 workshop funded by the White Rose Consortium) focus in particular on the coalition and Conservative governments’ ‘Northern Powerhouse’ agenda. They also analyse associated efforts to devolve power to local authorities across England, which promise to bring both greater prosperity and autonomy to the deindustrialized North. Several chapters critically interrogate these initiatives, and their ambitions, by placing them within their wider historical, geographical, institutional and ideological contexts. As such, the book seek to locate Northern England within a broader understanding of the political dimension of economic development, and outline a series of ideas for enhancing the North’s prospects. Contributors to the book include Ron Martin and Ben Gardiner (University of Cambridge), James Wilsdon (University of Sheffield), Kieron Flanagan (University of Manchester), Simon Lee (University of Hull), Georgina Blakeley (Open University) and Brendan Evans (University of Huddersfield), Martin Jones and David Beel (University of Staffordshire), and Nick Gray (Northumbria University) and Lee Pugalis (University of Technology, Sydney). The full table of contents is below. Craig’s contribution to the book focuses on industrial policy and deindustrialisation across the North, and Arianna’s contribution focuses on the uneven geography of city deals in Yorkshire. They also jointly author a concluding chapter which outlines both a forward research agenda, and a set of policy imperatives. ‘This outstanding collection shines a much needed light on the political economy of Northern England. The contributors delve into economic policy making, city-regional governance and the inequalities entailed by the current UK approach to regionalism and devolution. It performs an exacting multi-dimensional critique, from which academics, policy makers and activists will learn many valuable lessons’. Visit https://www.palgrave.com/gb/book/9783319625591 to order a copy.